Who needs synthetically infused vitamin water when a delicious natural beverage packed with antioxidants, phyto-nutrients and a great history is at hand? Being a firm believer in herbs and drinking mint, chamomile and sage teas for decades, the discovery of Sideritis, which is also known as “Tsai VouNou” or Greek Mountain Tea, has been a real treasure. Not just because of it’s refined, slightly lemony taste that becomes quickly addictive, but also because of it’s amazing health benefits! Hippocrates, the great philosopher and father of modern medicine, praised Greek Mountain Tea for its positive effect on the immune and respiratory systems. The Greeks have been using it for thousands of years and still reach for it when they have a cold, or are struggling with digestive issues. It is also used to relax and relieve stress. But despite its popularity in Greece, how come until recently in Holland I had never heard of it, nor in the US? What’s this mystery herb? More recently, modern science has begun to research the health benefits of Greek Mountain Tea. And some of the resulting studies indicate, this herb has more benefits then I could have imagined. For example, a recent research report by Brunswick Labs, a leading bio-analytical testing lab, noted a range of biological effects such as oxidative stress reduction, antioxident, antimicrobial, anti-inflammatory and gastro-protective activities. It also showed that Greek Mountain Tea is as potent as the highly popular Green Tea at inducing cellular antioxidant defenses and preventing oxidative stress. In other words: highly anti-aging benefits! Tsai VouNou is also known as Shepherd’s Tea because the Greek shepherds would brew it while tending to their flocks high in the mountains. The native herb of Saar Soleares Greek Mountain tea is called Sideritis Scardica. It has a lovely, mild taste, is 100% organic and naturally caffeine free. 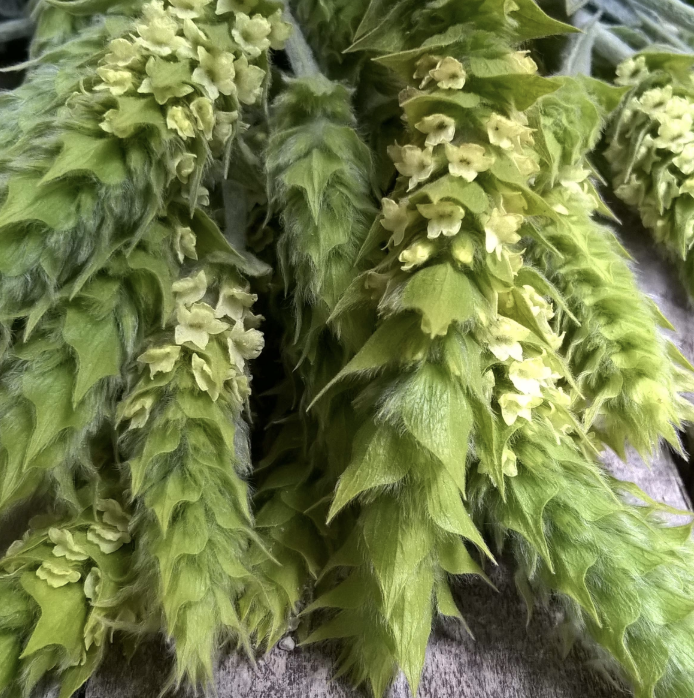 Our Sideritis grows in the Kavounia mountains on an organic farm. It is a purely forage area free from intensive agricultural holdings and pesticides, which makes the quality so special. Greek Mountain Tea is brewed using all parts of the herb (flowers, leaves and stems), however, the Sideritis herb does not give up its many benefits easily. It must be briefly boiled (3-5 minutes) as part of the steeping process in order to extract the full flavor and benefits. The taste of Honey combines really well with this tea, and will increase the benefits even more! Our small size container contains 10 flowers. To make one tea pot, you need 2-3 flowers. So this container will give you about 4 teapots and 40 cups of Thai VouNou Tea. Our Large size container contains 10 big stems with flowers. To make one teapot, you need 1 flower, so this container will give you 10 pots of tea and 100 cups of Tsai VouNou Tea. This is seriously the best summer drink I ever consumed and tops any recipe you can make with black or green tea! You boil the tea in the same way, but with a tablespoon honey or cane sugar. Then add cold water to dilute it and put it in the fridge for a couple hours. When it has cooled, throw in the ice cubes, a stem of mint, a wedge of lemon and enjoy!